Here you can order some other very good Havas New Approach books based on Kato Havas's teaching. 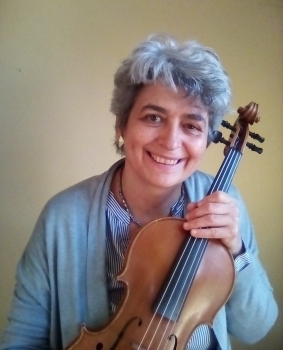 Ringing Strings and Dancing Bows have been written to teach the violin to children aged 7 to 11 and classes, but can be used also to teach anyone else. They are by Gloria Bakhshayesh, who studied with Kato Havas for many years and is her personal representative. The cellist's inner voice applies the New Approach principles to the cello. It was written by Ian Bewley, professor of cello at the Royal Northern College of Music of Manchester, who also studied with Kato Havas for many years. All of these books have been approved by Kato Havas. Often some readers have asked me where they could buy them, telling me that it is difficult to find them in music shops. So, to solve the problem, I made this page. From here, you can send your order straight to the publisher who will be very happy to send them to you immediately! You only need to fill in the form below, including your: name, surname, e-mail address, shipping address, city, province, post code, telephone number and all the required fields, with the asterisk. You should choose the books you want by clicking in the the boxes (one or more) near the titles and click on Send me these books. Make sure you type all information correctly, especially your e-mail address and telephone number, as it may be necessary to communicate with you about your order. The publisher will contact you. Then, for information on the status of your order, you can contact them directly. To ORDER THE TEACHING DVD, go to this page. Your personal details will NOT be passed on to anyone other than the publisher of the above-mentioned books and me. By sending your data, you accept that I can send you information about the Havas New Approach.